Warm, nourishing and often satisfyingly economical, having a couple of decent casserole recipes up your sleeve can see you through the winter months very well indeed. Sausages make a fantastic addition to a casserole, with plenty of lovely, juicy flavour to seep out into the stock as the dish cooks. They are also an incredibly versatile base for a casserole, pairing equally well with apple and root vegetables, wholesome lentils or delicately flavoured white beans. In the kingdom of sausage casseroles the French cassoulet is king, a hearty slow cooked stew of meat and white beans. A variety of meats can be used and pork, duck and mutton are often a popular choice, with the famous Toulouse sausage a seemingly ubiquitous fixture. 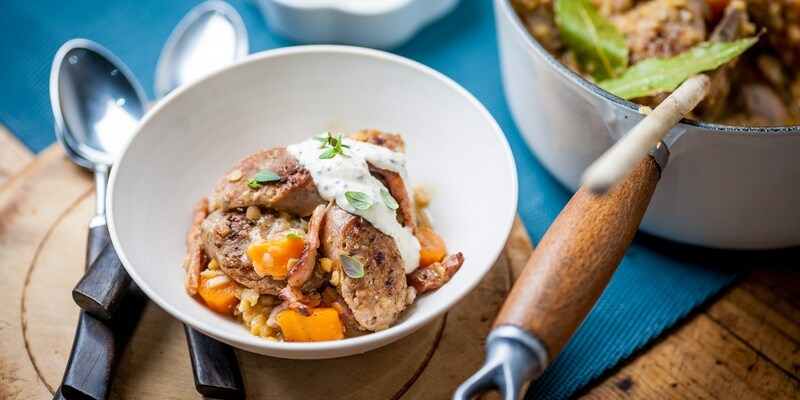 Andy McLeish's French cassoulet recipe includes confit duck leg alongside Toulouse sausage, and similarly the Galvin brothers pack their sausage cassoulet recipe with duck, pork and lamb. For a British take on this delicious dish try Geoffrey Smeddle's easy Sausage and lentil casserole, or Karen Burns Booth's Sausage casserole with apple and dumplings – for a simple, one pot dinner it's difficult to beat.